John and Mary Hadfield left their beautiful home in Glossop, Derbyshire or Mellord, England to join others of their family who had joined the Church of Jesus Christ of Latter-day Saints. They were my father’s parents. They established a home in Grouse Creek, Utah, where ultimately my parents raised their family. Grouse Creek, Utah, the little valley of sage brush and cedar covered hills. At the time of my birth it had a population of approximately 350 people. In this little community we lived and loved life. The remoteness of Grouse Creek created a need for us to make our own entertainment. This we did with great vigor and enthusiasm. I am Myrl and the oldest daughter of William and Grace Hadfield. I was born in a log cabin at the foot of a knoll. 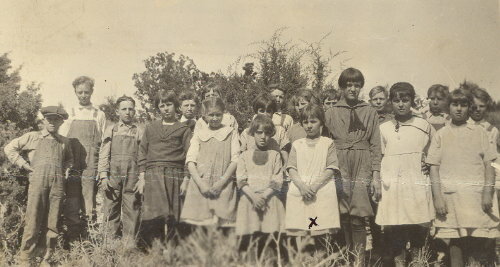 Grandmother Mary Hadfield and Aunt Ellen Blanthorn acted as midwives. This was a piece of farmland where several other siblings were also born. We lived in the log cabin until the big house our grandfather Isaac Jorgensen was building was finished enough to occupy. Our oldest brother, Gordon was born at Amalga, Utah in Cache Valley, Utah. 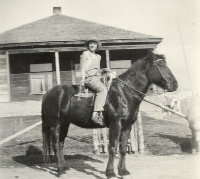 Crop failure and lack of money prompted our parents to return to Grouse Creek where they were homesteading etc. Norman was the first child born in the big frame house (this house still stands there at the top of the small hill that leads into town). The town consisted of mainly a post office, gas station, rock school and rock church. It once had a store and boarding house north of town that burned to the ground one Fourth of July when Grandpa Jorgensen (who owned the building) dropped a coal oil lamp coming up the stairs. We were a family of 10 children. Later in life we often nicknamed ourselves “The 10 Tribes of Hadfield”. This is the order of our birth: Gordon, Myrl, Ronald, Elden, Norman, Vonda, Max, Amy, Nina Grace and Dean. One of my earliest frightening experiences was that of being baptized in an irrigation ditch. I had been told by others (boys) being baptized that there were snakes in the water. Wellie Richins baptized me. Another terrifying experience to me happened one day at school when Floyd Ballingham hit my brother Gordon on the nose with a big rock. The greatest sport and the most run I had was horseback riding. I used to ride the range with Gordon. We rode together the times we were in plays and to choir practice and parties; also to sheep camps and getting in the livestock. We road horses back to the “Berg” as we often called the middle of the “Creek” to pick up mail. Transportation during these early years was mainly horse and buggy and buck board wagons. Our school wagon was called the “Band Wagon”. During the winter the wagon-box was put on sleigh runners and straw was placed on the floor then covered with quilts to keep us warm. All the activity, one-act plays, dances, and other entertainment took place in the basement of the old rock church. Everyone looked forward to the big 4th of July celebration. This occasion brought folks to Grouse Creek from neighboring communities for the rodeos, baseball games, etc. As children we enjoyed the boxes of pink Mother Goose popcorn and ice cream cones. We were always concerned that the ice would last long enough to keep the ice cream frozen until we had had our share. We participated in foot races and the cowboy skills were tested with wild bronco riding at the rodeo. But when evening came the mood quickly changed as we knew there were chores to do. There were cows to milk, eggs to gather before the hens went to roost and many other chores that accompanied farm life. On the 4th of July, these tasks were accomplished quicker than usual; and it was back to the celebration with a new set of activities. The Old Rock church was so built that the chapel had church meetings on the main level. There were stairs leading down to the basement where one act plays, dances and other entertainment could be enjoyed. 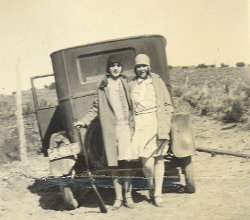 The Warburton brothers who lived over the ridge in a little place called Etna, Utah, provided the more professional entertainment. They had an orchestra with a piano, saxophone, violin, a real drum and vocalist. After they had performed, the benches were placed in such a way that the children (even babies) could sleep on the benches while the adults danced. I have a particular memory of Willie Shaw. He was the janitor and loved to dance. He would dance with the children and then pass them on to their parents for a swing. These indeed were wonderful times. We did not know of anything better that these great celebrations and it would be difficult to duplicate the wonderful community spirit that was shared during our 4th of July celebrations. The Christmas party and the banquets throughout the year always included music of various kinds. On some occasions residents of the neighboring communities of Lucin, Montello and Yost would join us in celebrations. I also recall that we had an excellent choir. Music, indeed, was a great part of our lives in Grouse Creek. Our lives were humble, carefree, and full of fun. Yet we had a variety of serious experiences. Such as a visit of a rabid wild cat that turned into a favorite bed time story “tell me the wild cat story.” Of course we had the broken arms, noses, ruptured appendixes, etc. There was no doctor after our grandmother Hadfield, a registered nurse died. She delivered all the babies and cared for the sick etc. At present I (Myrl 89 years old next October) am still the oldest living of the “Tribe”. Gordon was killed in a tragic farm accident. Years later Ronald fell on their basement stairs and died of a cerebral hemorrhage. Nina Grace, our youngest sister, died of liver cancer a year ago. Our father died at the early age of 43 of an illness called Brights Disease (Kidney Infection). So our mother at the age of 35 was widowed. We had many financial hardships during his illness and death. Just prior to his death, the banks all over Utah closed and we lost our entire savings. A rabid wild cat got into our livestock. We lost 3/4 of them. Out best milk cow, dog, turkeys and chickens included. The following fall all our best beef cattle dropped dead from alkali dust while crossing the desert to the winter feeding ground. Although money was always scarce, we had plenty of food to eat, a good warm home, and clothing, and wonderful neighbors and friends. Our closest Neighbors were Uncle John Hadfield and Aunt Pauline with their family who lived across the field from us. Then there were the Charles Toyn family with Archie being a special friend to us all. Further down the creek was the Elmer Kimber family. Elmer being our bishop and Emily their oldest daughter, my life long and true friend. Myrl attended school in the rock school, spending two years in the first grade due to shyness, so it is told. 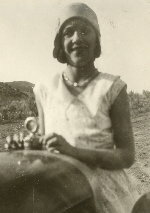 When there were no other classes for higher learning she later went on to school in Logan, Utah with two younger brothers, Ronald and Elden. They lived in Grandpa Jorgensen’s little yellow frame house. During the year a job opportunity at the Mountain Bell Telephone and Telegraph Company cut into Myrl’s education, but provided the necessary funds to live in the city and help others of our family to attend high school and graduate. 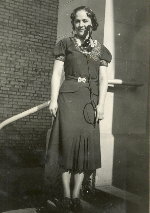 She worked as a “number please” girl until she met Foster B. Allen and became his wife on his birthday, June 21, 1938. Under his tutoring she later received her high school diploma. Her life time career and “pursuit of happiness” came as wife, mother and homemaker. Foster and Myrl are the parents of six children, twenty-nine grandchildren, and eighteen great grandchildren. Since retirement, Foster and Myrl have fulfilled four Spanish missions for the LDS church. They have been temple officiators at the Logan Utah, Atlanta Georgia,Argentina, and Mesa Arizona Temples. Foster passed away on November 28, 1995 after a valiant struggle with health problems. While Myrl was residing at Pines in the Park, a retirement home in Mesa, Arizona, she would communicate with others through an e-mail system she would operate through her phone. 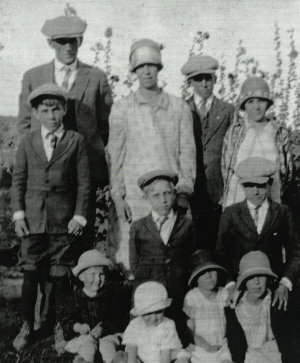 Myrl was instrumental in providing many of the personal histories and pictures of the Hadfield family. Myrl was 91 when she passed away peacefully on May 20, 2005. She is buried at the Logan Cemetery in Logan, Utah.